Remember the line, "Where have you gone Joe DiMaggio?" For this topic, it's "Where have you gone Magic Johnson?" 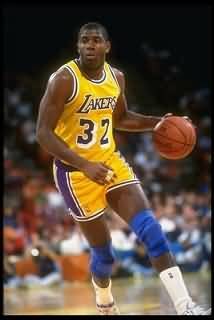 Magic was a great, unselfish TEAM player who may have been the greatest passer of all time (although John Stockton was pretty good too). Television focuses on watching the pros doing their one-on-one moves and slam dunks. Kids see this too. Team skills and delivering the perfectly timed and accurate pass aren't as flashy. Besides, who wants to do passing drills... everyone finds them boring, both players and coaches. On the other hand, excellent passing is the essence of outstanding team play, and it is really fun to watch a perfectly timed and delivered pass for an easy lay-up (or dunk). Poor passing and turnovers will kill your offense quicker than anything. A bad pass results in a turnover, no shot taken and an opportunity to score is lost. Players must become better passers and we coaches must continue to find ways to teach them to become better passers. Passing seems very easy when you have two players facing each other practicing chest passes or bounce passes. But put a defender on each one of them, and it becomes really difficult. So, I think that once you get beyond the early formative stages in a player's development, you must do passing drills with defenders involved to simulate game situations. Also, I think passing drills that involve players passing and catching on the move are better than stationary drills, since seldom in a game do you pass to someone standing still. A good pass is one that is caught by the receiver. 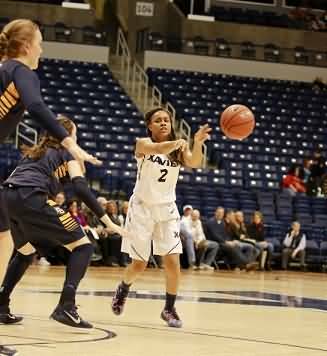 Successful passing involves two parts, making the pass and receiving the pass. The receiver should have "soft" (relaxed) hands, catch the ball with both hands and look the ball into his/her hands. The receiver should, in most cases, be moving toward the pass... "meet the pass". Most of the time, the receiver should not be stationary. The receiver must learn to get open by making V-cuts and back-cuts, and setting screens for other teammates and then sealing the defender and "rolling" off those screens (see Cutting and Faking, Setting Screens). A receiver should always know where the ball is. When passing (and receiving), use two hands. The three basic passes are the chest pass, bounce pass and overhead pass (also later consider the behind-the-back pass and the baseball pass). The technique is the same with all three... step toward the receiver, and extend the arms toward the receiver, with palms out and thumbs down. Be accurate and deliver the pass exactly where the receiver wants it. A big part of passing is making correct decisions with the ball. Make the simple pass, the easiest pass that will get the job done. 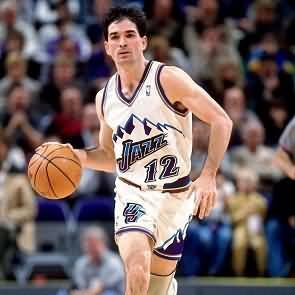 Don't make a crazy behind the back pass just to be "flashy", when a simple chest or bounce pass will work. Now there are times when a properly executed, behind the back pass is the correct pass to make (e.g. 2-on-1 break with the defender right in front overplaying you on the ball side), but we don't make that pass to be "flashy"... we make it because is the easiest and the correct pass in that situation. If a defender is in the passing lane, you don't force the pass. You should not pass into the defense, or "into a crowd" where your receiver is surrounded by defenders... sounds obvious but I see it all the time. Pass away from the defense. We use the phrase "see the defense". Do not pass into a situation where your receiver is not in a good position to receive the ball. An example of this would be passing up the floor against a press where your receiver has his/her back turned away from the hoop and there is a defender coming up on the blind side. This next point is very important. A good passer knows how to open the passing lanes by making a fake in one direction, and then passing the opposite direction. Legendary former coach Bob Knight has said that two of the most important and under-taught fundamentals are the pass-fake and the shot-fake. We use the phrase, "fake a pass to make a pass." Making a ball fake, head bob, pass fake, or just looking the opposite direction ("looking the defender off") will often open the desired passing lane. Do not look right at your receiver or "telegraph" your passes. Use your peripheral vision and keep your eyes forward and know where your teammates are at all times. Bad passes can result from dribbling with your head down, and then at the end of the dribble, making a quick pass... often to a defender who slips into the passing lane. A good passer knows how to deliver the ball with "touch"... that is, with just the right velocity and angle to make it an easy catch for the receiver. A pass can be in the perfect location, but if it is too hard, it is uncatchable by your teammate and you lose the ball. If your pass is too soft and easy, the defense can intercept it. You must learn to "anticipate"... that is, pass the ball to where your teammate will soon be, not where he/she is right now. You must lead the receiver, and not pass behind him/her. Good passing involves timing and communication between the passer and receiver. That's why it really is not an easy skill to master because it involves two players working together. Both the passer and the receivers must learn to read the defense. Learn to "drive and dish" where you make a penetrating dribble move, but then at the last moment when you have drawn the defense to you, you either make the bounce pass to a post player under the hoop, or you kick it out to the wing or corner for a three-pointer. Just like shooting, you must be under control when you make a pass. You should be balanced with both feet on the floor. When speed-dribbling down the floor on a fast-break, keep your eyes forward and stay under control so you can deliver the pass to the open teammate at the precise, correct moment. I see the following subtle passing error made occasionally on the fast break. The player speed-dribbling the ball up the floor, when making the final pass on the break, will sometimes at the end of the dribble bring the ball back on the hip to get more velocity on the pass. A hustling defender comes up from behind and pokes the ball loose from the passer… it usually goes out-of-bounds, but you have lost a chance to score a lay-up. When making this pass, keep the ball in front of you. Don't get into the habit of jumping when you pass. If you jump when you pass, you have no other option but to pass, and if the defense closes the passing lane while you are airborne, you're in trouble. See these Tips for Better Passing that will help you become a good passer and help you avoid passing turnovers. The wing player should first make a V-cut and the passer should time the pass for when the receiver breaks back out of the V-cut. If the defender is back off the wing player, pass the ball right into his/her numbers, or on your teammate's side toward the hoop, so that he/she is immediately is position to release the shot. If the pass is made to the outside, the receiver must first pivot and square up before he/she can shoot. Now, if the defender is up closer, make the pass to the outside of your teammate. If the defender is in the passing lane, your teammate should make a back-cut to get open... if not, he/she has no shot and you should look to pass elsewhere, or make a move yourself. Another point... the pass to the backcut can be a pass straight to your cutting teammate, or often a nice bounce pass leading the receiver will do the job here. Contrary to what is often taught, the chest pass is not real good here. To make a chest pass, you must have a clear passing lane directly in front of you. If the defender is in front of you, a pass that comes from your chest area is easily deflected. Use either the lateral pass or the two-handed overhead pass. In making the lateral pass, you fake opposite and then cross your opposite foot (the foot which is away from the direction of the pass) in front of you and step in the direction of the pass. You deliver the pass with some "zip" on it so it cannot be intercepted. For example, if you want to pass to the right, you make a fake to the left and then cross your left foot over in front of you while pivoting on your right foot and make the pass to the right. This is almost like a chest pass except the pass is not released from the center chest area, but more from your side. This pass is often used as an outlet pass off a rebound, or for a "skip" pass (a cross-court pass over a zone defense). It can also be used to quickly move the ball around the perimeter. Your target is your teammate's head... a little higher than the chest. In making this pass, do not bring the ball back behind your head… keep it straight up (or slightly in front) and over your head. Timing is very important here. The pass should be made as the post player is coming into his/her post position. A bounce pass is usually most effective and easiest to catch. Once the ball is on the wing, the pass to the low post should be made quickly before the defense is set. The passer should be able to clear the passing lane by making a good fake, and should also learn how to make the "step-around" bounce-pass (fake an overhead pass, and with the non-pivot foot make a long stride around the defender to improve the passing angle. Pass from and to the side away from the post defender. If the post defender is half-fronting on the baseline side, make the pass from the high side, and perhaps even take one quick dribble up for a better passing angle from the high side. If the post defender is half-fronting from the lane side, make the pass from the low, baseline side. When the low post is fronted, a lob pass over the top can be attempted, but only if your post player has a clear advantage... this pass is often unsuccessful. See the menu of standard passing drills on this web-site. In addition, I would incorporate passing drills where defense is played against the pass. Passing is easy and boring with no defenders involved. It becomes a very difficult skill once defenders are in place. Drills that involve players passing and catching on the move are better than stationary drills, since seldom in a game do you pass to someone standing still. You can design your own simple drills. One would be to practice the pass from point to wing and back, using one or two defenders. Teach the V-cut and back-cut. Teach the point guard how to make a nice leading bounce pass to the back-cutter. Another drill practices the wing to low post pass using two defenders. Teach the passer how to fake and open the passing lane and how to make the "step-around" bounce pass (see above). He/she must also recognize the correct target. If the defender is playing on the baseline side, make the pass to your teammate's hip on the lane side. If the defender is playing on the lane side, put the pass on your teammate's baseline hip. You can also front the low post and practice the lob pass "over the top". Another drill is to put your offense in a half-court set against a man-to-man defense, and have them pass against this defense... no dribbling allowed, unless it is a one or two bounce dribble to attack the hoop, or a drive and dish. After five possessions, switch offense and defense. Make sure your receivers are making good V-cuts or back-cuts and they come to the ball when receiving. Here also is an opportunity to stress the importance of setting good screens. All passes are caught with two hands with the receiver in triple threat position. Also practice passing against various zones, again with no dribbling... get them to move the ball quickly in order to over-shift the zone. Use the two-handed overhead pass and skip passes. Get them to recognize the gaps in the zone. Use the bounce pass into the post, and make good inside passes. Not only do these drills help your passing, but also help your team to learn how to break zone defenses down... and it's a lot more fun than just doing simple partner passing drills. Another drill in transition would be to simply run your press-breaker against a press defense, and allow no dribbling.